The destroyed headquarters of Uzenmunaigas, the company at the heart of the protracted labour dispute in the oil town of Zhanaozen in December 2011. Credit: Joanna Lillis/IPS. ALMATY, Kazakhstan, Nov 29 2012 (IPS) - This December will see the first anniversary of unrest which left at least 15 dead in the oil town of Zhanaozen in western Kazakhstan. As Catherine Ashton, the EU High Representative for Foreign Affairs and Security Policy visits the Kazakhstan capital Astana on Nov. 30, concerns are being raised that the last year has seen a serious erosion of rights in this Central Asian country, with political, civil and media liberties being curbed, as the authorities in Astana construct their narrative about what went wrong in Zhanaozen. The main target of Astana’s ire has been the unregistered Alga! Party. On Nov. 20 the General Prosecutor’s office announced it was seeking a court order prohibiting the activities of Alga! and its ally the People’s Front movement in Kazakhstan. It labelled the unregistered organisations “extremist” and also applied to ban two independent newspapers Respublika and Vyzglad, along with a number of associated websites. The crackdown comes a week after Kazakhstan was elected as a representative to the UN Human Rights Council for a three-year term and a day after Vladimir Kozlov, the head of Alga!, lost an appeal against his seven-and-a-half year sentence for plotting to overthrow the government and fomenting the unrest in Zhanaozen, which grew out of a protracted oil sector strike. International advocacy groups also expressed concern about Kozlov’s jailing and the failed appeal. The U.S. also expressed concern over Kozlov’s conviction and “the apparent use of the criminal system to silence opposition” in Kazakhstan. Yet Kazakhstan’s government, led by strongman President Nursultan Nazarbayev, who has been in power for over two decades and brooks little dissent, rejects allegations that the post-Zhanaozen landscape is marred by an erosion of civil liberties. After Kozlov was first sentenced on Oct. 8, Foreign Ministry spokesperson Altay Abibullayev defended the legal process, calling Kozlov’s sentence “the result of an impartial and objective investigation” He pointed to the fact that the trial was open and that media and civil society groups were granted free access. During the trial Kozlov was accused of working in tandem with disgraced banker Mukhtar Ablyazov, operating his Alga! party – which the government has long refused to register so that it can operate legally – as a “criminal group”. The Kazakh authorities claim that the party is bankrolled by Ablyazov, who has been in hiding since fleeing London in March after he was sentenced to 22 months in prison by a UK court . He was being sued for fraud when he was convicted for concealing his assets in violation of a court order. A total of 17 protesters and former oil workers from Zhanaozen have been imprisoned in relation to unrest in trials marred by allegations that evidence had been coerced out of suspects by torture. Six members of the security forces are serving sentences over the violent deaths, which occurred when police opened fire on unarmed demonstrators. Three local officials have been jailed on charges of graft that Astana says fuelled disaffection in Zhanaozen. Astana’s critics say political freedoms have come under threat in Kazakhstan in the last year. An election in January replaced Kazakhstan’s previous one-party parliament with a multi-party legislature – but all three parties in the parliament are loyal to President Nazarbayev. Kazakhstan has never held an election deemed free and fair by international observers. Kazakhstan’s other genuine opposition force, OSDP Azat, was vocal in the aftermath of the January parliamentary vote, holding monthly protests – but these gatherings petered out by June after some of the party leaders had served short prison terms for rallying without official permission, a crime in Kazakhstan despite the right to do so being enshrined in the constitution. 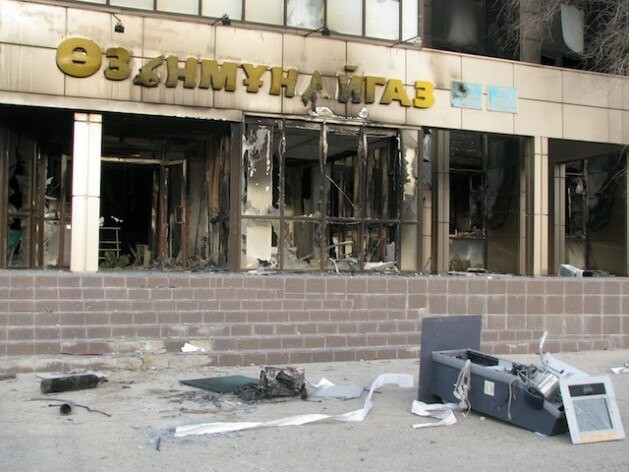 Kazakhstan’s independent media has also been under pressure in the aftermath of Zhanaozen. In January Igor Vinyavsky, editor of the weekly newspaper Vzyglad was detained on charges of seeking to overthrow the state, but was then amnestied in March. The Respublika newspaper, which the authorities allege is funded by Ablyazov, has also felt the squeeze, with its journalists hauled in for interrogation by the security services. The verdict in Kozlov’s trial alleged that he and Ablyazov used Respublika and other media to incite unrest. State-controlled media, meanwhile, have launched blistering attacks on Kozlov, Ablyazov and Alga!. The Khabar TV channel broadcast a scurrilous documentary on Nov. 15 which linked Ablyazov with the financing of the party and portrayed it as a money-making exercise. Two days earlier human rights activists Galym Ageleuov and Murat Tungishbayev were named in an article in the state-run Kazakhstanskaya Pravda newspaper which accused them of being “paid servants” of Kozlov and Ablyazov.